Last edited by Chad; 09-27-13 at 05:42 PM. The Possession (2012) really works. I initially dismissed it as just another PG-13 throwaway but despite some familiar elements it's a lot of fun; like a modern jewish Amityville Horror with actual creepiness and good tension. It's well executed even if some of the content doesn't feel fresh. The similarities to Amityville Horror seemed striking at times. The moths everywhere (like bees in AH), stress from family discord, appeal to religious figures. I'd be curious to see if anyone else thought thought elements of The Possession were overly familiar not just in comparison to Amityville horror. The exorcism subplot seems over-used, right down to the "take me instead" bit and suddenly limber kid, I kept myself braced for pea soup spew that never came. I really like the near end hospital segment which seemed brilliantly composed and gripping. Horror films take liberties with "based on a true story" taglines, but the introduction here seems to suggest this was based on "true events." Does anyone know anything about that? Kudos to ntnon for the subset pick. The Blu-ray had a little featurette on the "true events." I got the impression the incident was vastly blown out of proportion for the movie and could have been done as a publicity stunt. Supposedly someone bought the cursed box off of eBay. I kid you not. Just watched it. Maybe I'm just unlucky, but it seems whenever I stream a movie the night it's assigned my stream is bad quality. It was an alright movie. Yeah, there are lots of familiar elements from other movies here. And the PG-13 takes away a bit of bite that other movies have. For example, the nastiest thing the demon-possessed child could say was "I don't like you anymore". Regan would not be impressed. It was nice to have the Judaism angle (though you could swap in a priest for the rabbi and the exorcism scene wouldn't be that different). 1. Talking on your cell phone while driving is more dangerous than performing an exorcism. 2. When at a yard sale, if you see an old box with arcane symbols on it that whispers to your daughter ... pass on it. On the flip side, if such a box is in your possession a yard sale is a great way to get rid of it. 3. If you're not good at basketball it may be time to start playing with the invisible ball. 4. If you're possessed by a demon/spirit, an MRI can pick it up! Last edited by brainee; 10-16-13 at 04:16 PM. The assortment of supposedly haunted stuff on ebay is mind numbing up to a $200,000 "haunted" funeral home. I can't tell what is worse, the rash of remakes or "hollywood" turning to Ebay for feature stories. The movie worked out really great but when you put it that way it sounds like a dud. The featurette actually interviewed the owners of the box, they seemed like fairly lucid people. Being an atheist, I have a strange affinity for possession movies and I have no idea why. But alas, this one left me cold. I thought the little girl did a good job with her role but there were really only one or two truly creepy parts (my particular favorite was the little girl standing under the red exit sign stating the exact same thing over and over again in the exact same way...with some creepy repeated gurgling sounds in the middle). I have watched a lot of horror movies in my day and I have yet to comprehend why when something strange is going on, no one ever turns on the lights. Oh yeah, and hospitals are completely without staff, visitors, other patients or cameras at night. The whole box theme kept my mind on Hellraiser more than anything. And "based on true events"...yeah, right. I felt this was one of the weaker "possession" movies that has come out in the last few years. It held my interest, but just barely. My rating: *** out of *****. Did you stream it through Netflix? Even if your connection is on the slow side you can force it to stream in HD, you'll have a longer buffer time at first but it's better to watch a movie nice and sharp. How can you force it? This is a trick I would like to know! I watch Netflix on both my 360 and my PS3 (mainly my PS3). 1) hold ALT + Shift and Left Click on the picture. I think anything higher than 1750 should give you 720p and the higher selections give you 1080p. You'll have to wait for the movie to buffer, but it should force a higher video quality when it's finished. ^Anybody know how to do this on the 360 or PS3? You can go to "Your Account", then down to "Your Profile", and then to "Playback Settings". My defaults to "Auto", but there are three other options. I honesty don't know if selecting "High" will force the PS3 or PC to buffer the stream a little in order to show HD or not, but it's the only choice I see. 5. When you want to save a little on the cgi budget, shoot through all the drinking glasses on the counter. 6. Get the iPhone 12 flash LED light when searching large open spaces. 7. Don't make a move toward the possessed girl's Eggo. 8. We find out how Gollum made a little cash between LOTR and The Hobbit. Last edited by cproaps; 10-30-13 at 01:23 AM. I loved it. I found it to be a mostly understated, engrossing piece of filmmaking. It wasn't ever balls-out scary, but it had a nice vibe going and was always interesting. I wasn't expecting it to be any good, so I was surprised that I enjoyed it so much. I was so afraid that it was going to turn out to be dreck like The Haunting in Connecticut or An American Haunting, to pick two PG-13 horror movies that I really disliked...yet it entertained me, often in spite of its flaws (such as the aforementioned MRI dybbuk scan and Gollum's cameo). Not perfect, but MUCH better than I expected it to be. Last edited by rbrown498; 10-30-13 at 11:46 PM. Is there some specific mythology that gives background on ghosts turning into flying bugs or being associated with them? 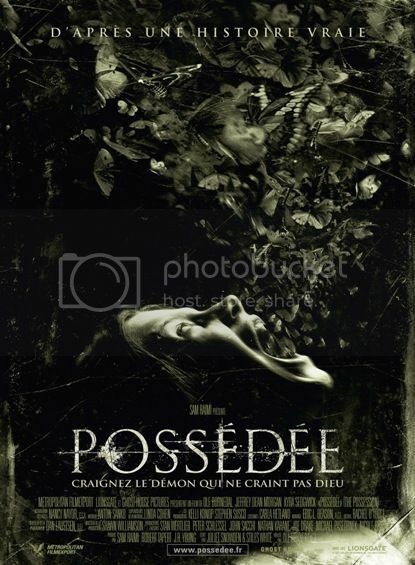 I noticed the girl "screaming" butterflies on the poster and keep seeing that sort of imagery so wonder where "everyone's" getting so inspired to connect ghosts/demons with bugs. I liked this one. Didn't break any new ground, but the cast was solid and the pacing was good. Some creepily effective scenes and nice effects work, too. Also liked that they went with Judaism instead of the typical Catholic route. -When the Dad goes to the Rabbi for help, the Rabbi is all like "A little girl is being posessed by a demon? Eh, sounds dangerous. I'll leave it to the Lord's will. See ya." I used to be an atheist too. I think these types of films have always freaked me out because deep down I know there's some truth to it. I can't watch The Exorcist alone or at night. I'll echo these thoughts. I wasn't expecting much, but it kept me on edge all film. I'm a firm atheist who enjoys possession or religious horror too. It might be the subtle theme of trusting the supernatural/ambiguity to find something horrifying. Maybe it's the subtle mockery of religion in these movies or a subtle black humor approach they take to things. I think part of it is the rich history tapped into with established religious canon (there's an automatic backstory so easier to focus on the present without over-explaining). I think part of it is just my general preference for supernatural horror material, and often religious horror films really go for the gusto with over the top adversaries (like a genie who lives in a box, or some grand spectacle of evil like the devil). I'm agnostic and I also have a preference for supernatural horror flicks, and always enjoy religious/possession flicks. I was thinking about it earlier in the month while watching 11/11/11, it struck me as strange that I don't believe in anything like that, but I really enjoy movies about the subject. The Exorcist is one of my favorites, and I also love Exorcist 3. This movie was better than I thought it would be. Despite my appreciation for flicks like this, I have stayed away from movies like The Devil Inside and the Last Exorcism.. of whatever because they genuinely looked awful, and the consensus is that they are. Possession was decent, but still pretty generic. It was enjoyable enough, but I don't think I'd rewatch it. One thing that bothered me is the editing in this movie, I'm a professional video editor, so it really stood out to me. The movie probably had a low budget and the director wasn't able to shoot as much footage as he would have liked, but a lot of the scenes have jarring cuts, or fade to black prematurely, leaving the entire movie with an awkward mise-en-scene. I wonder if anybody else felt this way, or just me because of my attention to detail when it comes to editing. Thank you - but Amazon deserves the credit! I just browsed their Prime selection! Definitely true! Particularly in terms of raw numbers! Also reasonable points: strange objects that talk to you are not a good idea (even the generic talking toys can be a hazard - they all start talking in the middle of the night and creep people out, even if they aren't possessed); and people will buy ANYTHING if it's cheap at a yard sale..! I've won consistently since I stopped using a real ball. I don't know if that's true or not, but you never know..! I know people like French & Saunders - and maybe even Scary Movie - have done similar things, but I'm waiting for an anthology film that is just a collection of shorts in which they start off following the events of a known film/story, and then 'finish' it by having happen "what a normal person would do". The killer in the robe trips over his robe trying to run at superhuman speed; the old dark house has a lightswitch; someone listens the first time the expert says "he's a vampire for the following obvious reasons"; someone steps in and turns off the demented scientist's power; the scientist/killer/villain gets locked up the first time they do something wrong; someone walks past at the wrong (right) time and intervenes in a useful way; the creepy man in the creepy house IS NOT a serial killer; etc.